You are here: Home / Holidays & Seasons / Get Guest Ready for the Holidays in 6 Simple Steps! The holidays are when friends and family seem to spend the most time together. If you’re hosting guests who are coming from out of town you want to be sure they are comfortable in your home- it’s their home away from home for the holidays, after all! Think about when you are traveling and staying with friends or family. It’s not always easy to feel comfortable when you are out of your element, so it’s important to take a few extra steps to ensure your guests feel relaxed and right at home. They will be so appreciative! Make sure your guest’s room or space is clean and tidy. Change the linens, fluff the pillows in the dryer with a dryer sheet for a bit so they smell “refreshed,” and have an extra blanket in case they are chilly at night. You should have two pillows per guest, preferably one soft and one firm for each guest. If you don’t have a dedicated guest room, but your guests will be staying in one of your bedrooms, make sure it is tidied up and organized. Be sure to clear space in the closet and offer a dresser drawer or two, or provide a luggage rack, so guests can organize their clothing. Head over to Fox Hollow Cottage for more tips! Comforts of home: I like to leave guest towels on our guests’ bed because then I know for sure the towels they use are in good shape. A basket with some essentials they may have forgotten and access to your wifi is also nice to have on hand. In addition to toiletries, water bottles, a few snacks & ibuprofen are also a nice gesture. If it’s Christmastime, Christmas cookies are a great idea! Visit HappyGoLucky for more tips! Be sure to set out current magazines, interesting books and instructions on how to work the TV so guests can feel at home relaxing in their room for a bit. Not everyone likes to be “involved” 24 hours a day, so be sure your guests can escape for a bit if they need a break from your household. Be sure to provide your guests with some household information – specially if there will be times you are not home with them. This can include how to work your coffee maker, wifi information, where the first aid supplies are, how to work tv’s, how to work the washer & dryer, the names of some stores in the nearest shopping area so guests can find them using their smartphone maps, and where to find snacks, coffee, etc. Also be sure your home address is posted in a prominent area just in case there is an emergency. Real Simple (my favorite magazine!) 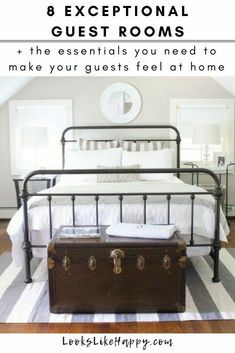 has a great article on How to Make a Guest Welcome Kit that is worth a quick read. If your guests are staying for an extended time and you won’t always be home, put together a list of local attractions, museums, restaurants and other things to do to keep them entertained. If you’re hosting over the holidays, give their room some holiday touches to make them feel a little more at home. Sometimes it’s hard for people to be away from home over the holidays. A holiday pillow on the bed, a stack of faux gifts wrapped nicely or even holiday colored fresh flowers are a great extra touch that doesn’t cost much and will be greatly appreciated. Pretty easy, right? 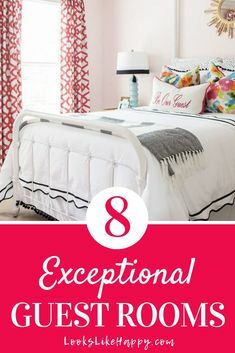 Your guests will love that you took a little extra time to make sure their stay is a comfortable one- it’s also a great way to reinforce that you are so happy to see them and host them in your home! With these extra touches your guests are sure to feel right at home for the holidays. Check out our Holiday and Seasons section on the blog for more ideas! You’ll find our 10 Christmas Mantles (+bonus decorating hacks!) post and also our Winter decor post – Decor to Last the Whole Season!